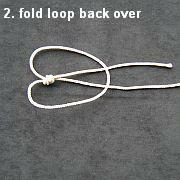 The Larks Head Knot is an amazingly simple yet useful knot! The great thing about this one is that no matter how tightly it gets stressed while holding all the tension of a flying line, it is fairly easy to remove. The thicker the line, the easier it is to loosen the knot. 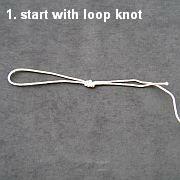 The Lark's Head starts with the Loop knot. Grab the line to which the Lark's Head is attached, on either side of the knot. 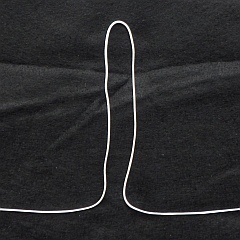 Loosen the line, then ping it tight again by separating your hands, several times. Often, the Lark's Head will loosen just a little, making it easier to unpick. 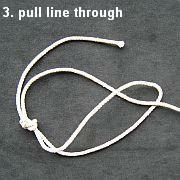 Get a finger-nail in between the 2 strands of the Lark's Head, right where it is sitting on the other line. Work the 2 loops apart a little. This also can make the knot easier to unpick. 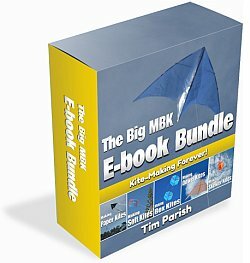 Just about every MBK kite uses a short connecting line between the bridle and the flying line. It's part of the bridle really. 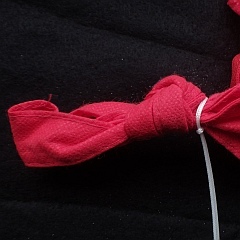 The flying line is attached to this connector with a Larks Head Knot, making it easy to swap the line from kite to kite. Where else might you use a Lark's Head? Well, I use it to connect the lower bridle lines of the Roller and Dopero kites to their keels. In those cases the knot stays done up all the time. That's because the kites can be packed away after carefully pulling some of the lower bridle lines' length through the slits in the sail. One more application. I use the Larks Head Knot to attach tensioning lines to the upper and lower horizontal spar bow-lines of the Dowel Sode kite. What a mouthful that was :-) With the 2 bowed spars tensioned away from each other, the kite has a tighter sail and flies much better. One last point about flying line attachment. 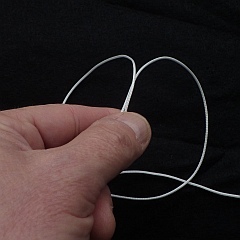 For smaller kites, the Larks Head can be done with a Simple Loop Knot - as in the illustrative photos at the top of this page. 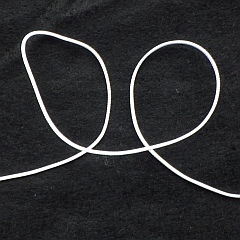 However, you can get a significantly stronger connection between a flying line and a BIG kite by using a Double Loop or even a Figure Eight Knot instead. I've called this one the Anchor Loop for want of a better or more official name. 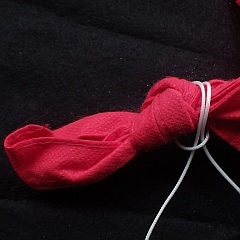 However, this really neat method of attaching a kite line to a sand bag anchor belongs on this page, since it resembles the Lark's Head knot. 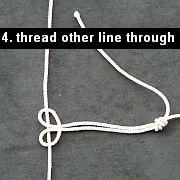 It's even simpler since you start with a loop in the line that is not already knotted!